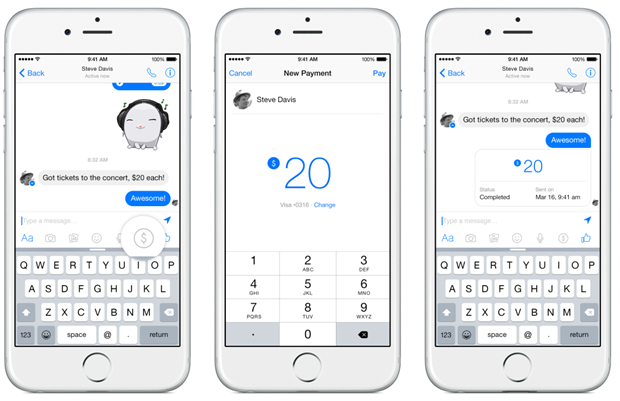 Facebook Brings Free Money Transfer Feature on Messenger! Money Transfer on Social Media platforms seem to be hot right now. Every major bank and financial institutions are trying to simplify how money gets transferred, bet it between friends, or be it between Business. In India, Kotak, ICICI Bank and HDFC bank have all come up with money transfer features on either Facebook or Twitter. Now, Facebook themselves have got into the fray and have announced free funds transfer feature on Facebook messenger. And from the looks of it, it is as easy as it gets. According to official announcement, Facebook is now rolling out a more convenient and secure way to send or receive money between friends. This feature will be rolling out over the coming months in the US. While the money transfer happens immediately, it may take some time for the money to reflect in receiver’s bank. Even though, this is pretty new phenomenon, small money transfers on social platforms are getting extremely popular. They are simple, secure and seamless. These types of funds transfer are basically geared towards smaller transactions that happen between friends and families, and because of this Facebook becomes the ultimate platform, because every is comfortable with it. While, till date, Banks and financial institutions were doing it for their customers, with Facebook coming into fray, this is bound to go mainstream. Unfortunately, it is currently launched only in the U.S, but we are quite sure it should come to Indian soon enough! If you are in US, give it a try and let us know what you think of Facebook’s new money transfer service. "Facebook Brings Free Money Transfer Feature on Messenger! ", 5 out of 5 based on 1 ratings. 6 Mistakes First Time Entrepreneurs Make Online, And How To Avoid Them! Attention Android App Developers, Google Brings Sweeping Changes To Playstore App Ratings! 5 Crore Facebook Accounts Hacked – 6 Facts Every Social Media User Should Know!